Composed by James Horner (1953-2015). Easy Piano Songbook. Movies. 72 pages. Published by Hal Leonard (HL.316030). This deluxe songbook features eleven pages of color photos from the movie, and the instrumental selections from the soundtrack: Hard to Starboard • Hymn to the Sea • Never an Absolution • Rose • Southampton • Take Her to Sea, Mr. Murdoch • Unable to Stay, Unwilling to Leave. 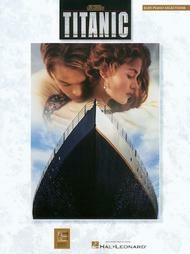 Also includes the piano/vocal arrangement of the hit single “My Heart Will Go On (Love Theme from Titanic).”. much of a problem. The songs sound great and are really easy to get in to. I highly recommend buying.